In a battle of wits, who will win? 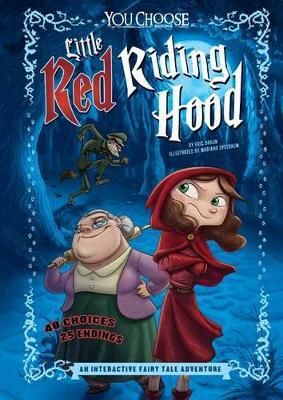 Little Red or the Wolf? The epic struggle between the two takes some unexpected twists in this fractured retelling of the beloved fairy tale. Who do you trust? What do you do? When You Choose the path through three new versions of this fairy tal... read full description below. Eric Braun is a strange and handsome man who has written dozens of books for kids and teens, sometimes while wearing a hat. He lives in Minneapolis with his wife and sons and gecko. Learn more at www.heyericbraun.com Mariano Epelbaum is a Character Designer, illustrator and traditional 2D animator. Working professionally since 1996 in various disciplines of Animation and Illustration where characters that designs tend to be very expressive and original. Currently in art direction on several projects, always trying different styles and techniques. As an animation artist, participated in outstanding productions in Argentina, as Character art director and character designer of Foosball, Argentine-Spanish 3D production directed by Juan Jos Campanella, Garc a Ferr movies Manuelita and Coraz n, las alegr as de Pantriste; Micaela (Encuadre SA), Bah a M gica (Bitt Animation), the three films Dibu and TV series mi familia es un dibujo (Patagonik film Group), and scenes of the film Og y Mampaton ( Hook Up Animation). He has also worked in various animated commercials.In the field of illustration collaborated with Spanish publishers Edeb , Planeta De Agostini, Vicens Vives, Bromera, Imaginarium and Estudio Fenix. He also did work for Alfaguara, El Gato de Hojalata, Pictus, Clasa, Grupo Editorial Norma, Puerto de Palos and Ediciones Urano from Argentina and Santillana from Puerto Rico, United States and UK.